Do you have dishes that remind you of your childhood right away? These things you would have liked to eat every day as a 6-year-old? Maybe noodles with ketchup? Nutella bread, cinnamon toast crunch or maybe a pizza à la papa? I have a few such dishes that immediately put me 20 years back. Often I even know where, with whom and when I ate it. For example, in my home we sometimes had oats with sugar and cinnamon and a cup of milk for us children. That’s no different than roasted old fashioned oats with lightly caramelized sugar and cinnamon. Can you imagine how good that was?! Rice pudding is also at the forefront. Creamy, warm rice pudding or how we call it: milk rice. Soulfood level 100 and every time a guarantor that we tidied up our toys and put on our pyjamas without complaining. The big advantage of growing up is that you can make such dishes at any time. Theoretically daily. As a child I was sure that as soon as I grew up I would eat rice pudding and Nutella bread every day and I would probably lick out a whole bowl of dough without baking a cake. 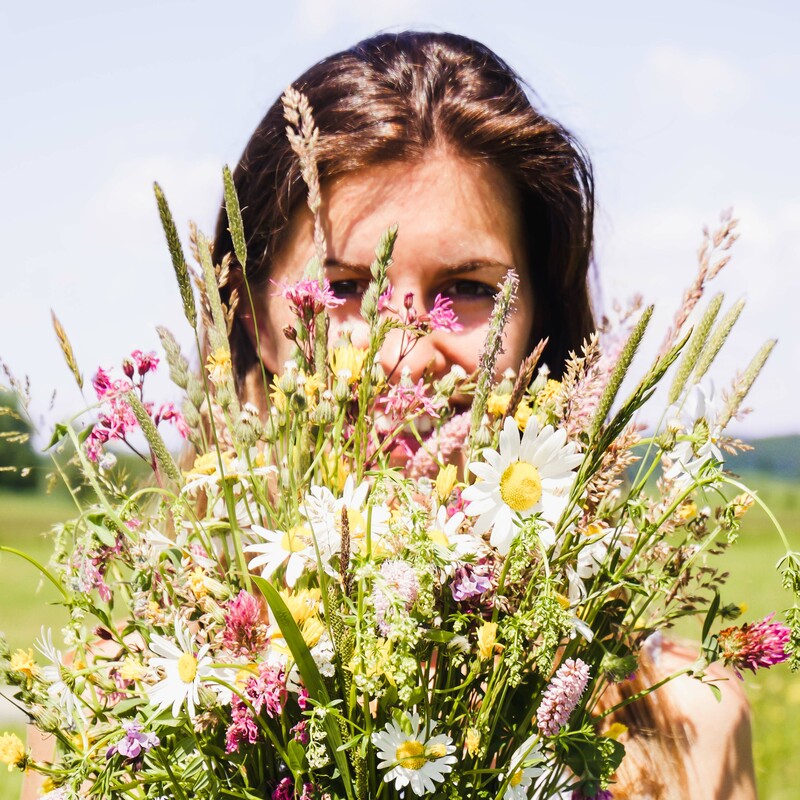 These things have remained childhood dreams just as much as the desire to become a princess. That’s okay, though. After all, there are so many dishes that would like to be tried. For example, I wouldn’t want to miss the Crepes with Caramelized Pears or the Baked Cinnamon Donuts with Maple Glaze. I still have rice pudding at regular intervals. 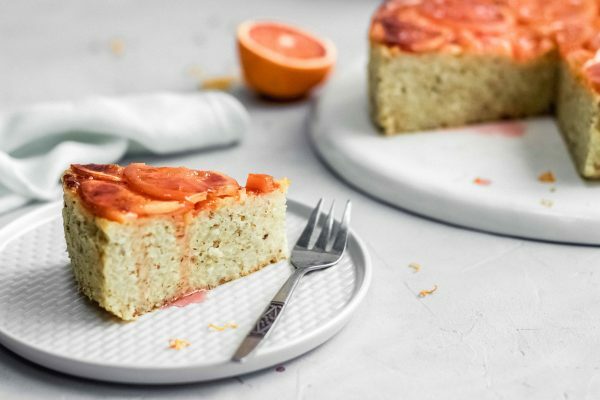 Recently in the form of this milk rice upside-down cake. 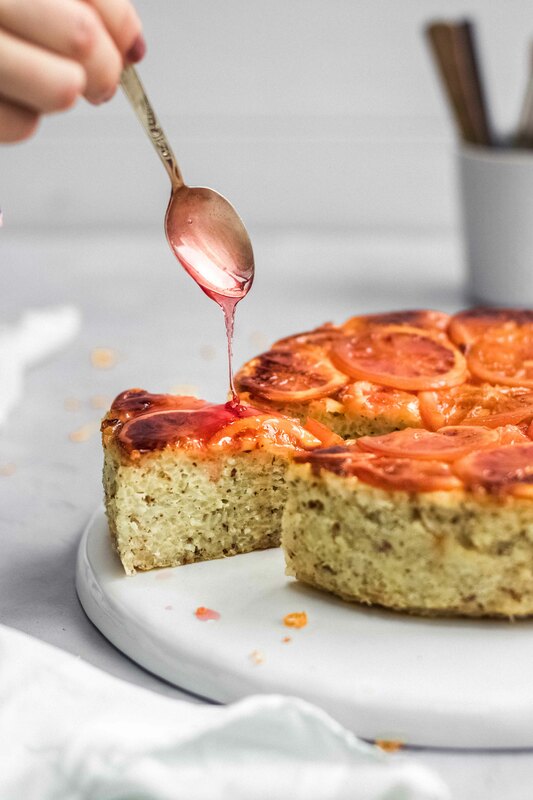 This cake is super easy to make and a dream both for the eye and the mouth. 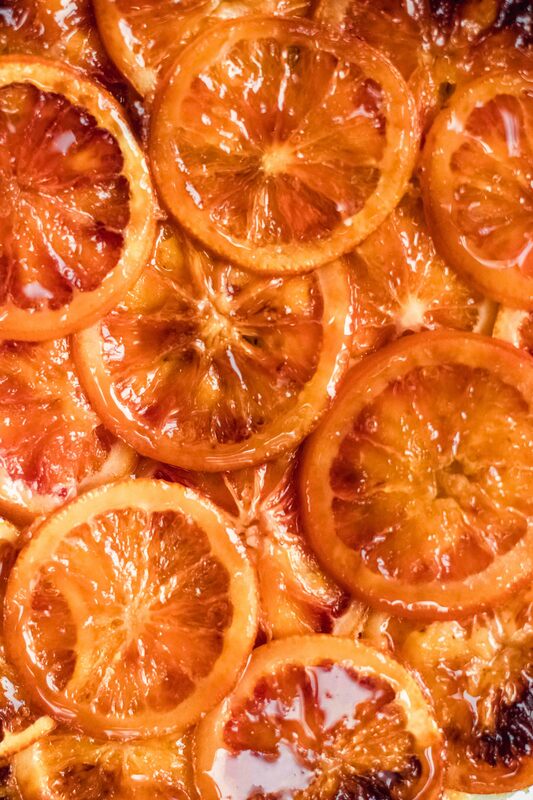 The (untreated) organic oranges are thinly cut before baking and cooked for a few minutes in a water-sugar bath. This gives them an ideal consistency and caramelises them beautifully. If you have A) no organic oranges at hand and/or B) don’t like the slight bitterness of the peel, you can also cut away the peel including the white part. For the “dough” you simply cook a rice pudding as usual. After cooking mix with eggs and grated almonds, pour onto the oranges and bake. 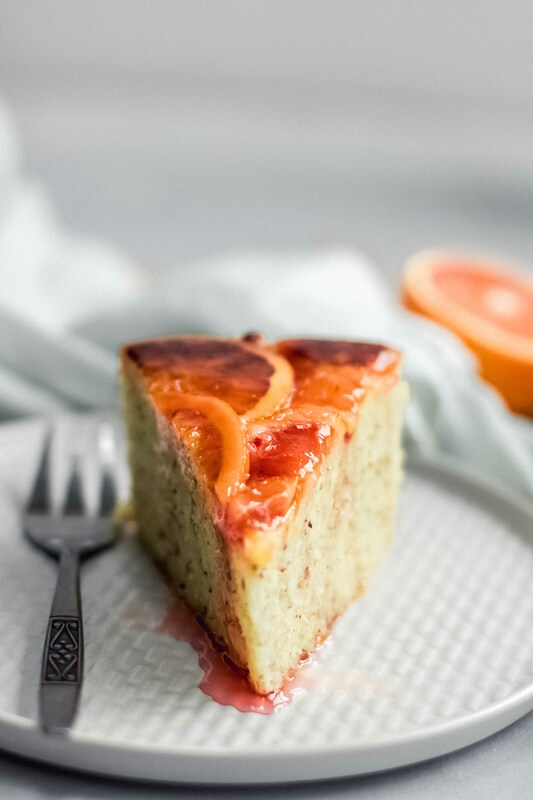 You experience the first magic moment when you put the cake out of the mould and you see the oranges shine. So beautiful. 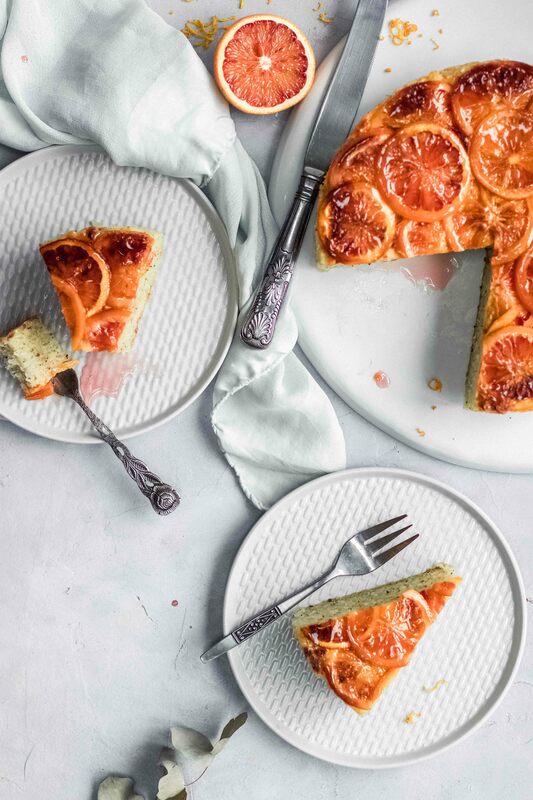 A childhood dream come true: MILK RICE ORANGE UPSIDE-DOWN CAKE. Say rice pudding for breakfast, as dessert and in the evening on the couch. Line a baking tin (approx. 25cm diameter) from the inside with non-stick baking paper. This is important so that the juice of the oranges cannot escape. 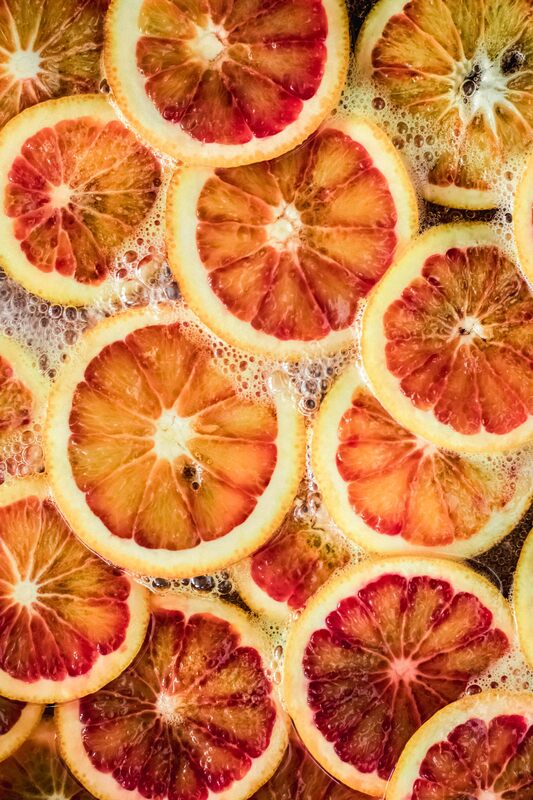 Wash the oranges hot and dab dry. Grate the peel of one orange and squeeze out the juice. Put aside. Cut the remaining 3 oranges into slices about 3 mm thick. Remove the seeds. Put aside. Put the rice, milk, brown sugar, salt and the fine orange peel in a saucepan. Bring to the boil once. Switch back to a low setting. Simmer for about 35 minutes until the rice is soft and the milk has absorbed. Stir constantly during that time. Allow the rice pudding to cool briefly. Stir in eggs, grated almonds and vanilla. Preheat the oven to 170°C / 350°F. While the rice pudding in the pot add 120 g sugar and 80 ml water into another pan and boil once. Switch back to low temperature. Simmer for approx. 3 minutes until the sugar has dissolved. Stir constantly. Place the orange slices inside. All should be covered with the sugar water. Let simmer for 5 minutes. Turn and simmer for a further 3 minutes until the edges become glassy. 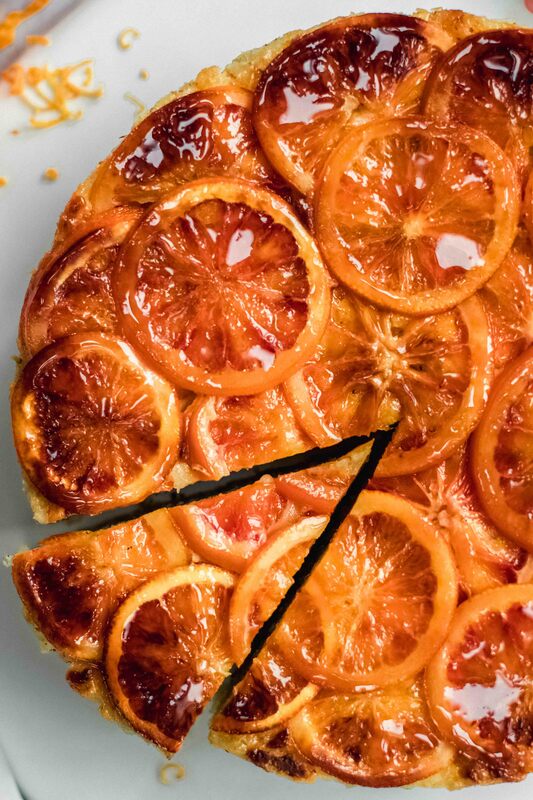 Carefully lift the oranges out of the pan with a fork and place in the baking tin. The orange slices can overlap slightly. Add the squeezed juice of an orange to the sugar syrup in the pan. Thicken for 5-10 minutes, stirring constantly. Pour the syrup into a glass and serve later with the cake. Empty the rice pudding onto the orange slices in the baking tin. Bake in a preheated oven for approx. 35 minutes until the surface is slightly golden. Allow the cake to cool in the pan for 30 minutes at room temperature. Then carefully turn the cake onto a plate and remove the baking paper. 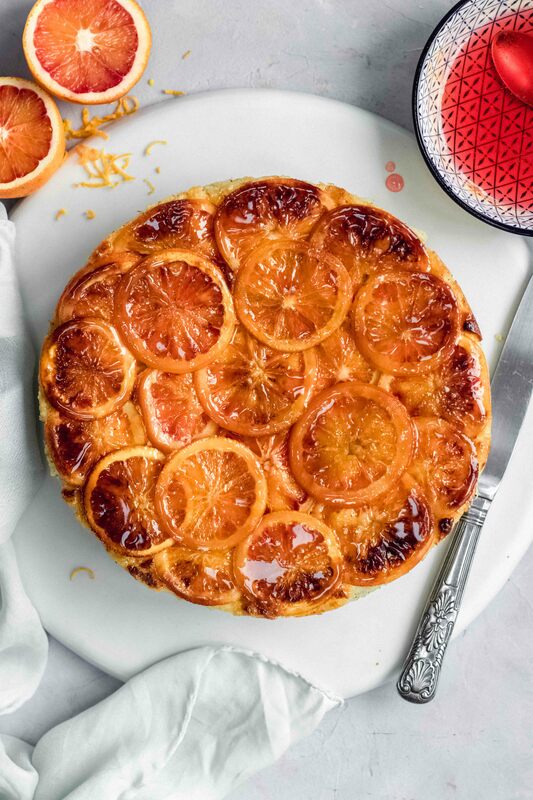 The milk rice orange upside down cake tastes amazing lukewarm and completely cooled down. Tip: Serve with whipped cream or vanilla ice cream and the orange syrup for a delicious dessert.